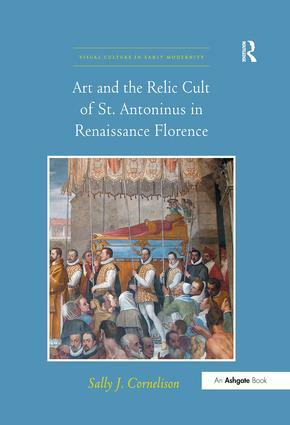 Tracing the history of St. Antoninus' cult and burial from the time of his death in 1459 until his remains were moved to their final resting place in 1589, this interdisciplinary study demonstrates that the saint's relic cult was a key element of Florence's sacred cityscape. The works of art created in his honor, as well as the rituals practiced at his fifteenth- and sixteenth-century places of burial, advertised Antoninus' saintly power and persona to the people who depended upon his intercessory abilities to negotiate life's challenges. Drawing on a rich variety of contemporary visual, literary, and archival sources, this volume explores the ways in which shifting political, familial, and ecclesiastical aims and agendas shaped the ways in which St. Antoninus' holiness was broadcast to those who visited his burial church. Author Sally Cornelison foregrounds the visual splendor of the St. Antoninus Chapel, which was designed, built, and decorated by Medici court artist Giambologna and his collaborators between 1579 and 1591. Her research sheds new light on the artist, whose secular and mythological sculptures have received far more scholarly attention than his religious works. Cornelison draws on social and religious history, patronage and gender studies, and art historical and anthropological inquiries into the functions and meanings of images, relics, and ritual performance, to interpret how they activated St. Antoninus' burial sites and defined them in ways that held multivalent meanings for a broad audience of viewers and devotees. Among the objects for which she provides visual and contextual analyses are a banner from the saint's first tomb, early printed and painted images, and the sculptures, frescoes, panel paintings, and embroidered textiles made for the present St. Antoninus Chapel. Contents: Introduction; Part I: The humblest of men; Miracles, images , and St. Antoninus' first tomb; Nurturing the cult, c.1512-1579. Part II: Opus Iohannis Bolognae Belgae; A very rare thing; Sculpting the image of Antoninus; Ritual piety and Medici pomp; Epilogue; Bibliography; Index. Sally J. Cornelison is Professor and Director of the Florence Graduate Program in Renaissance Art at Syracuse University, USA.